Echinacea, how do I use my home-grown plants? Q: I have had some echinacea purpurea growing in my Sydney, Australia garden for a couple of years. How do I process and use the plant – should I collect the leaves, petals, stems, roots??? Should I make tea with them or grind them into powder? How? What then? 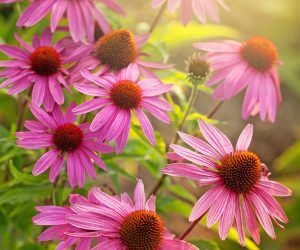 I have looked at lots of echinacea sites; most are full of info about the benefits, but none tell me how to use my plants. A: Get a book. Specifically, “The Complete Illustrated Holistic Herbal” by David Hoffmann. This book was written and originaly published in England but has since been published in the U.S. and Australia. The Australian publisher is ELEMENT BOOKS LIMITED 33Park Road, Milton, Brisbane 4064. On page 87 it has a listing for Echinacea angustifolia which states that the roots are used in either a decoction or a tincture. There are many other more detailed bits of information in other sections of the book. I have had no luck starting the purpurea variety from seed but have recently discovered a wild stand which will provide roots for transplant. In the case of echinacea, you can use all parts of the plant; though the roots retain the most effective medicinal properties. Roots should always be either decocted or extracted (in a tincture). The flowers and leaves can be prepared as a tea.